Inquiry Based Maths Assignment; Shapes and Patterns - Extend learning of 2D shapes and patterns with links to the real world. Grades 3-5. Enrich and extend your students' understanding of shapes and patterns with this simple but effective shapes project. Students link their learning to real life by exploring a range of different 2D shapes and patterns in the real world. 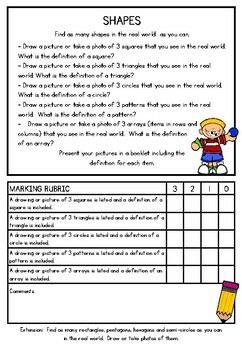 Perfect as an extension for those early finisher or just as an assignment at the end of a shapes or patterns unit. This work beautifully for my more advanced students who needed a deeper learning of shapes and patterns. Please use this as an inquiry based assignment, which is student led and teacher assisted. I promote a student centered learning environment and this assignment is designed to be used in this environment. Students should lead all investigations and become independent critical thinkers with this project. Rubric is included and should be talked through with students to provide them with your exact expectations, setting the scene for an independent learning situation. This project also comes in an 11 project bundle, saving you dollars if this is the type of learning you use in your classroom. Inquiry Based Maths Assignment; Plan a Party - Extend budgeting & operations. Inquiry Based Maths Assignment Around the World - Extend budgeting & operations. Inquiry Based Maths Assignment Number Fun - Extend learning of 4 digit numbers.